REC 2/3 HAS HIT THE RESET BUTTON! 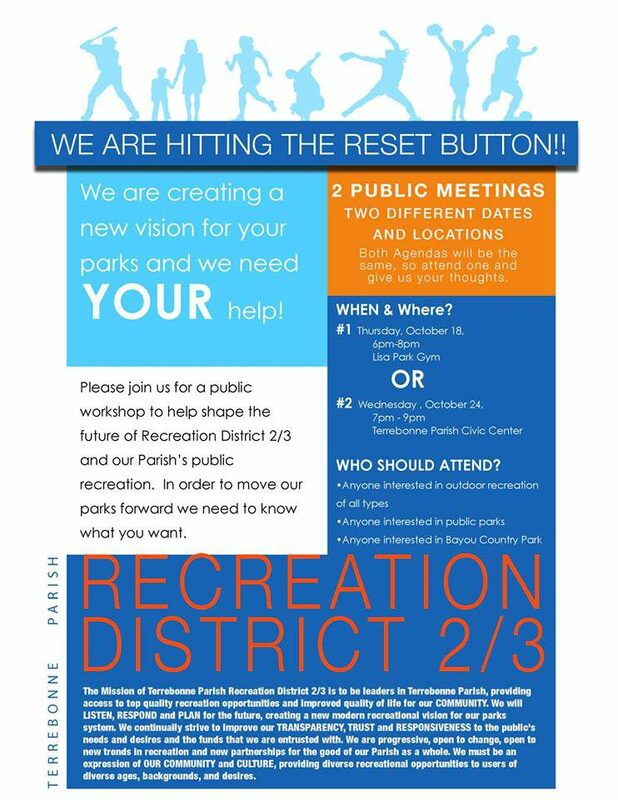 Terrebonne Parish Recreation District 2/3 is moving forward! While new construction is ongoing at Bayou Country Sports Park, the new Board of Commissioners has started a visioning process that will set a new course for the recreation district and a new approach to recreation in our parish. Out of this process will come a clear direction and action items to move our parks forward. A full day Board Visioning Retreat was held on August 17, 2018, where ideas for core values and new mission statement were developed, and the future of Bayou Country Sports Park, as well as all of the parks in the district was discussed. See below for our new core values and mission statement, which were adopted at the regular board meeting on October 4. We now need the public’s help to plan for the future of our public recreation. We are having two open houses, so we can get the pulse of the community and are calling for your help. We need good public input so that we can best serve the public needs. Both meeting agenda will be identical, so attendance at one will suffice. TRUSTWORTHY – To always be transparent and open to the public, communicating: listening and informing as to all things Rec 2/3. CARING – To provide a safe and caring environment for public recreation to our citizens, families, and visitors. RESPONSIBLE – To provide appropriate and efficient use of public funds, creating a stable financial future for park development, redevelopment, maintenance and programs. QUALITY ORIENTED – To continually build new and upgrade old facilities, to create best in class recreation opportunities, and to design, build, and maintain beautiful parks that are specific to the recreation industry and the needs of our users. PROACTIVE – To plan, to take action and LEAD a new vision for Recreation in the District and Terrebonne Parish. The mission of Terrebonne Parish Recreation District 2/3 is to be leaders in Terrebonne Parish, providing access to top quality recreation opportunities and improved quality of life for our COMMUNITY. We will LISTEN, RESPOND, and PLAN for the future, creating a new modern recreational vision for our parks system. We continually strive to improve our TRANSPARENCY, TRUST, and RESPONSIVENESS to the public’s needs and desires and the funds that we are entrusted with. We are progressive, open to change, open to new trends in recreation and new partnerships for the good of our parish as a whole. We must be an expression of OUR COMMUNITY and CULTURE, providing diverse recreational opportunities to users of diverse ages, backgrounds, and desires. Rec 2/3 – Bayou Country’s beacon of good clean fun!